Hometown Bicycles: Descendants of Levon (DoL) Concert: Let's Rock the Shop! 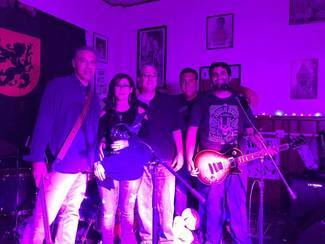 Descendants of Levon (DoL) Concert: Let's Rock the Shop! Team Hometown Bicycle's multi-talented Title Sponsor, Vinnie Baylerian with Pro-Motion Physical Therapy, rocks the bass in a band called DoL (Descendants of Levon). We're thrilled to be hosting DoL on Saturday, April 13th for a FREE concert on the shop floor! Join us from 6:00-8:30 PM for music, dancing, light munchies and refreshments, and a fun evening to kick off Hometown's birthday month. Yes, Hometown Bicycles turns 9 years old in April and we look forward to celebrating with you more than once throughout the month! BYOB. Bring a chair or two, if you can. We'll see you there! Be sure to also mark your calendars for Saturday, April 27th for our official Hometown Birthday Bash and Fundraising Concert to benefit the Brighton High School Cycling Club. Dan Tribble and his Progressive Blues & Rhythm Band will be in the house! I'll be at the concert! Rock it out Vinny !